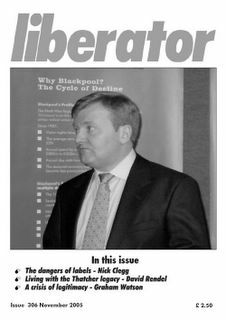 Liberator 306 - out now! If you are a wise person and subscribe to Liberator magazine, then the latest issue will be popping through your letterbox any day now. Nick Clegg, Lib Dem MP for Sheffield Hallam, on the dangers of political labels. David Rendel, former Lib Dem MP for Newbury, on the legacy of Thatcherism - the central role played by greed in British politics. Graham Watson MEP, leader of the ALDE group in the European Parliament, on the crisis of legitimacy in supranational institutions and NGOs. All the regular features, including Commentary, Radical Bulletin and Lord Bonkers. Liberator has been published regularly since 1970 and is now widely recognised as the leading journal for thought and comment among British Liberals. Indeed, it has been the only outlet for political thought that has stayed open for business throughout the lifetime of the Liberal Democrats since 1988. (If you live outside the UK, details of how to subscribe can be found on the home page of the Liberator website). Looking forward to my copy fluttering elegantly through my letterbox. Get all Punjab Government Jobs Notifications here for all qualifications like 10th, 12th, technical and Any Degree etc. and latest Job updates.